Bond Is Back! But Is He Relevant? Daniel Craig returns as 007 in “Skyfall.” Picture © 2012 Danjaq, LLC, United Artists Corporation, Columbia Pictures Industries, Inc.
Skyfall, the latest James Bond film, does not start with the opening of the audience looking out of the barrel of a pistol while Bond turns and shoots the audience. 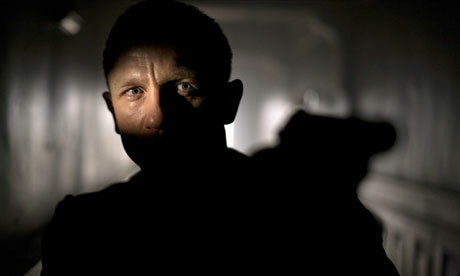 Instead, it opens with a beautifully shot scene of Bond in the shadows and out of focus in the background. As he walks into the foreground, he steps into sharp focus. And from an artistic standpoint, Skyfall has the best director, writers, cast and cinematography of any Bond film. But if that is true, why was I so dissatisfied with my experience? After the opening shot, Bond goes on a classic pre-credit action sequence. He rides a motorcycle along Turkish roofs and drives a Caterpillar tractor on a moving train. This is great Bond stuff! Then the whole film grinds to a glacially slow pace. There are action scenes along the way, but not many. But the movie keeps asking the question: does the world still need James Bond? It is asked, literally, in the film. But the audience is being asked the same thing. Didn’t they address that question in Casino Royale? They rebooted Bond in that movie, giving him a bit more backstory than he’s ever had in the films. Yet Skyfall spends so much time creating Bond’s backstory, I thought maybe it was another reboot! Daniel Craig is the best Bond ever. He captures the toughness of the Bond in the books and does a great job bringing something resembling emotional depth to the character. He has some great moments in the film. Judi Dench turn as M this time is the best she has been in any James Bond film. She plays M as a complex lady with emotions, albeit protected. Javier Bardem radiates inspiration in his role as Silva, an MI6 agent gone rogue. He plays the character as outlandish and effeminate. The few scenes he has with Craig are great. And, like Quantum of Solace (directed by Monster’s Ball director Marc Forster), the producers chose a director known for artistic ability rather than box office draw. Sam Mendes (American Beauty, Road to Perdition and Revolutionary Road) directs a Bond film as concerned with its characters as it is for its action. But, the film fails to explain why we need James Bond. The film’s message is clear: James Bond is not Jason Bourne and the producers are not going to try to change him (they tried that with Quantum of Solace and failed). Yet Bond seems out of touch with a society that no longer has Cold War monsters to fear. Part of Silva’s plan is to release the identities of British operatives working undercover in Al Qaeda terrorist cells. As the names get released, agents die. That seems like a much better story, but the film only uses it as a reason for Bond to return to work. And that’s the problem with Skyfall. A story about an agent in deep cover getting exposed and trying to survive is a great story. It would engage the audience and use real-world fear to maintain intensity. But Bond plays outside of the real danger zones. And so does Skyfall. Review © Paul George, 2012.